This album was recorded by Lonnie in Nashville in 1978 and it features the music of Elvis’ Las Vegas orchestra band and music arrangements and singers The Imperials with Shaun Nielson singing his ‘O Sol O Mio’ part. It is a very exciting collection of Elvis’ live concert songs using his concert arrangements with Lonnie singing them in his own style. These are not the original versions in the style Elvis recorded in the 50s’ and 60’s, they are the 70’s concert versions. 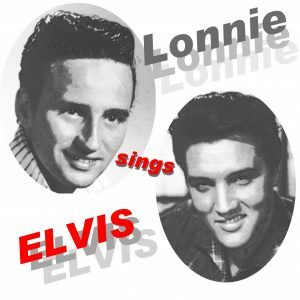 Lonnie gives a unique Preamble to the song ‘The King is Gone’, which makes reference to his being crowned ‘Australia’s Elvis’ in February 1957. A Legend offering his n tribute to the greatest Legend.